Talk about the element of surprise. One minute you’re blowing the leaves away and the next you’re in the middle of cloud of plastic shrapnel. Depending on where and how you’re holding this thing—a good deal more tender body parts could suffer harm. 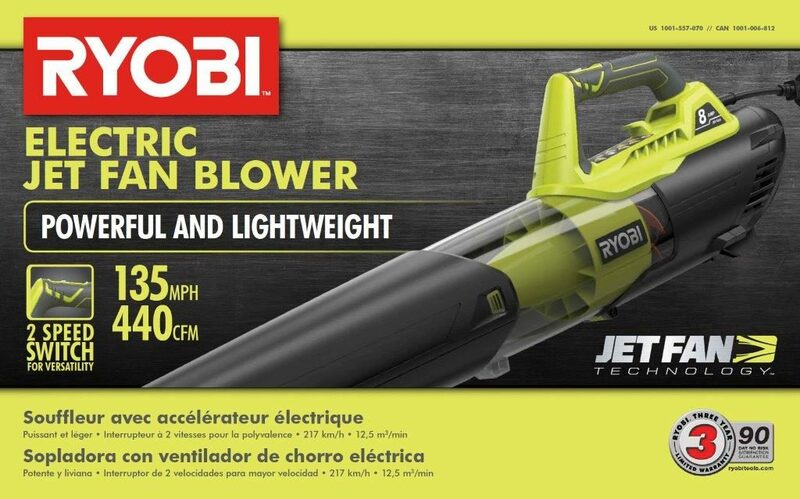 About 121,000 of these defective Ryobi Electric Jet Fan Blowers were sold in the US with another 1900 in Canada and 1100 in Mexico. We can all breathe a huge sigh of relief however, as the CPSC notes that no property damage has been reported. Depends how you define property, I would say. Here’s the skinny: the recall involves the Ryobi 8 amp Electric Jet Fan Blowers with model number RY42102 and a serial number between EU15401D170001 and EU16239N999999. The model and serial numbers are printed on the data label on the bottom of the blower. The blower is black and green with “RYOBI” printed on the side of the blower. “8amp JET FAN” is also printed on the side of the blower. Given the number of “incidents” (not sure exactly what that refers to) and injuries, it seems this recall might be just a bit overdue . If you own one of these things—you’re being advised to stop using it. If you contact One World Technologies, Inc. they will provide you with a free replacement—one that presumably doesn’t turn into a weapon of mass destruction. FYI—One World Technologies is the importer. The blowers were sold exclusively at Home Depot stores nationwide, in Canada and Mexico and online at www.homedepot.com from December 2015 through December 2016 for about $40. And while we’re on the subject of gardening—what ever happened to rakes? Good for the heart, good for the environment—easy on the ears and not prone to explosions of any kind. That’s left to the user’s discretion. Here’s the full information about the Ryobi recall from the CPSC. This was posted on Wednesday, March 15th, 2017 at 9:06 am and is filed under Defective Products, Recall . Feel free to respond, or trackback. Read our comments policy. While using my RY42102 blower(090264001) the red fan blew apart, sending pieces out the discharge. Luckily I ended up with minor lacerations.All I’m asking for is my money back or a new blower. Thank you. Please reply. What about compensation for people like me that have had it explode on them befor being notified of a recall?? It was not fun and it hurt like being sand blasted with sharp plastic chucks.